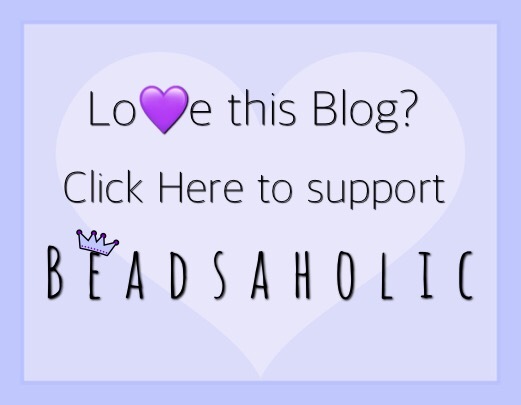 Today Beadsaholic brings a review of some of the latest releases and exclusives from Niwa Beads! Yesterday being the first day of Spring I wanted to share three beads from Niwa Beads that I feel are perfect for Spring and Summer compositions. Niwa Beads Rolle Fresh is very limited and an exclusive only at Beads Fanatic. This is a baby glass design with shades of green, blue, and CZ’s encased in clear. Each bead measures approximately 12 mm high x 9 mm wide and retails for €50, price includes vat. Here I have placed the Niwa Beads Rolle Fresh with Chronicles White Rose Amber, two beads from Aqua Hand-made & Gifts, Redbalifrog’s Bubble Stoppers on a Trollbeads Twisted Bangle. 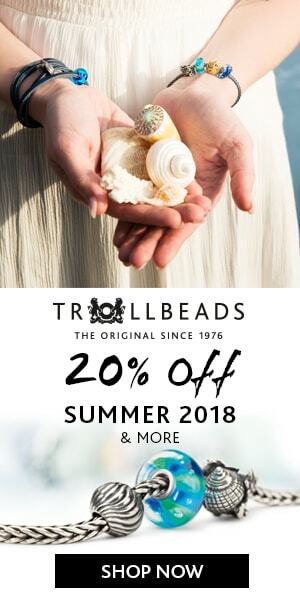 This perfect spring composition consist of Niwa Beads Rolle Fresh, Butterfly Lock, four Wings of Beauty in silver, gold and rose, Aqua Hand-made & Gifts Barrels, Redbalifrog Bubble stoppers on a Trollbeads Twisted Bangle. Niwa Beads Daisy Garden Malachite Dangle is a stunning rich green dangle with a beautiful garden bail with flowers and a dragonfly. From top of bail to the bottom of the dangle this bead measures approximately 26.14 mm high x 10.24 mm wide and weighs 4.8 grams. Daisy Garden Malachite Dangle retails for €59, price includes vat. Available at both Niwa Beads and Beads Fanatic. Malachite is a stone of protection and absorbs negative energies. I truly love the Niwa Beads Daisy Garden Malachite with four Wings of Beauty, Trollbeads Malachite stones, Redbalifrog Frangipani Stoppers on a Trollbeads Twisted Bangle. Here is the same combo; however, I’ve switched up the design and added the Trollbeads Indian Cress Flower. Niwa Beads Daisy Garden Turquoise Dangle is such a stunning dangle bead with a beautiful genuine turquoise drop. The bail and cap also have flowers and a dragonfly. This dangle measures from top of the bail to the bottom of the turquoise 26.04 mm high x 10 mm wide and weighs 4 grams. Daisy Garden Turquoise Dangle retails for €59, price includes vat and is available at both Niwa Beads and Beads Fanatic. Turquoise brings the wearer luck, and protection. I really need to buy some nice Turquoise stones to go with the Niwa Beads Daisy Garden Turquoise dangle; however, I really love it here with Sticks & Stones Amazonite Matte Wheels, Trollbeads Rose of June, Niwa Beads Two-tone Wings of Beauty, Redbalifrog Frangipani Stoppers on a Trollbeads Twisted Bangle. Sticks & Stones Amazonite available here. I truly love this next composition for summer! It reminds me of a tropical vacation. In this composition are four beads from Aqua Hand-made & Gifts, Niwa Beads Daisy Garden Turquoise Dangle, Two-tone Wings of Beauty, Redbalifrog Frangipani Stoppers on a Trollbeads Twisted Bangle. Aqua Hand-made & Gift beads available here. Both Daisy Garden Dangles are nice stacked together in this simple composition. Both designs consist of Niwa Beads Daisy Garden Malachite, Turquoise Dangles, Wings of Beauty, Trollbeads Baby Breath, Redbalifrog Bubble and Frangipani Stoppers on a Trollbeads Twisted Bangle and a Bella Fascini Twisted Bangle. Over all, these are the perfect additions to any collection that would be perfect for both spring and summer. If you like the three beads from Niwa Beads, I suggest ordering soon as they are rather limited. Star Bijou has sold out of the dangles; however, Beads Fanatic and Niwa Beads have limited stock available. If you would like to order the dangles you may do so at either link below and if you would like to order the Rolle Fresh its only available at Beads Fanatic. ← Aurora Shamrock’s Fairy Release! I like the colors on the Fresh, but I’m not fond of the larger end caps. The detail on the dangles is so pretty. You put together some nice combos! How long, on average, would you say it takes to create a post? I can’t imagine having the patience and getting it so nice — I get cranky just trying to take a couple of photos now and then. Thank you, Lizzie! Usually it takes me a couple of days to complete a blog post. From taking photos, choosing photos to use, processing and gathering info, layout etc. Honestly it depends on what all I’m covering in one article and whether there needs to be a back story. Also, larger releases take longer.